Absorption Chillers Market: Global Industry Size, Value, Share and Forecast. The latest report by Persistence Market Research titled ‘Absorption Chillers Market: Global Industry Analysis and Forecast, 2017–2025’, gives a comprehensive outlook of the global absorption chillers market. The report starts with a detailed yet concise executive summary that contains a terse market overview of the global absorption chillers market and gives the important market numbers based on a detailed forecast. The executive summary also explains in short the drivers, restraints and trends operating in the global absorption chillers market, providing a view that is taken on the various market forces and how these are likely to impact the global absorption chillers market worldwide. The executive summary also contains a list of main market players operating in the global absorption chillers market. Both value and volume CAGR forecasts and market numbers are given in the report as well as the main segments by technology, by absorber type, by application and by power source. The executive summary presents the overall market approach taken by the leading market players operating in the global absorption chillers market along with the most attractive target applications and regions as per the market dynamics of the global absorption chillers market. The differentiating strategy of the leading market players is also presented in a concise form in the executive summary through which the report audience can gain a deep perspective regarding how the market leaders are maintaining their pole position in the global market for absorption chillers. The subsequent section of the report deals with the market definitions and explains in detail what absorption chillers are and their types based on their operating principle. After this section comes the important section of the report where market taxonomy of the global absorption chillers market is highlighted. This is an important section of the report as it breaks down the absorption chillers market based on technology, absorber type, power source, application and various regions. After the market taxonomy, there is a section of the report devoted to absorption chillers market analysis scenario that presents the global absorption chillers market volume analysis and a regional average pricing analysis. The price of the product has been benchmarked considering 300 RT (Refrigeration Ton) as the standard capacity and the pricing analysis has been given for all the five regions as mentioned in the market taxonomy. Subsequently, there is a section devoted to the global absorption chillers market value analysis which presents the value forecast from 2017 till 2025. After this, there is an important section of the report devoted to the global absorption chillers market value chain that explains the profitability margins of absorption chillers manufacturers coupled with technology and service providers. Subsequently, the global absorption chillers market supply scenario is mentioned, which breaks down the percentage wise production of absorption chillers as per the regions assessed. In the following sections, there is a detailed explanation of the market dynamics operating in the global absorption chillers market that explains comprehensively the market drivers, restraints, opportunities and trends that are influencing the global absorption chillers market and gives a detailed insight on the factors that are both expanding and reducing market growth. After this, the subsequent sections of the report contain important information regarding the global absorption chillers market forecast by technology, by absorber type, by power source, by application and forecast based on the various regions. In each of these sections, there is vital information pertaining to the absorption chillers market like the year-on-year growth rate, absolute dollar opportunity, Basis Point Share analysis along with the market attractiveness analysis. Last but not the least, there is an entire section of the report devoted to the competition landscape of the global absorption chillers market. 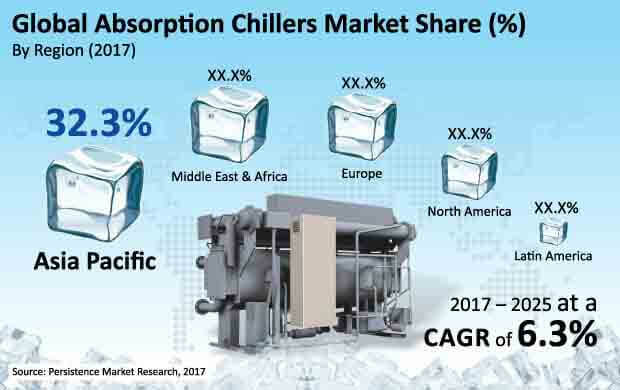 This competition landscape gives a dashboard view of the key companies operating in the global absorption chillers market along with their important information and broad strategies adopted to stay as leaders in the global absorption chillers market. Each of the leading companies is also profiled individually and important information such as company details, company description, product portfolio along with key developments concerning the company and strategic analysis is presented. A SWOT analysis of each leading market player is also presented providing detailed information about the strengths, weakness, opportunities and threats. This competition landscape is the most important section of the report as it imparts a deep understanding of the leading companies operating in the global absorption chillers market and is valuable for new entrants in the field to get a learning about how the companies are leading this lucrative market and also for the established market players in order to get a better understanding about their competitors. Overall market size has been analyzed through historical data, primary responses, and public domain data. Revenue of companies in the absorption chillers market has been benchmarked to ascertain the market size for the base year. Macroeconomic indicators such as GDP and industry growth have been considered to forecast the market size over the forecast period. The historical growth trend of end-use industries, market participants’ performance, as well as the present macro-economic outlook has been taken into consideration for estimating the overall market trend forecast. This data is then validated with the help of the triangulation method and is extensively scrutinized using advanced tools to garner quantitative and qualitative insights into the global absorption chillers market. As per Persistence Market Research analysis, by the end of 2017, global sales revenue of absorption chillers is expected to touch nearly US$ 1,300 Mn and is expected to cross US$ 2,050 Mn by the end of the year 2025. The global absorption chillers market is expected to exhibit a CAGR of 6.3% during the assessment period from 2017-2025. Demand for renewable sources of energy is increasing, wherein the primary source could be utilized in a more efficient manner for other related applications. The use of absorption chillers powered by solar energy (other than natural gas or fuel) for large chilling applications is gaining popularity, which in turn is increasing the demand for absorption chillers. The advantages of using solar power absorption chillers is that it provides maximum cooling performance while minimizing the consumption of electricity, and thereby reducing the ever increasing electricity consumption in summer, primarily attributed to conventional air conditioner systems. To underscore this point, example can be given of the upcoming event of Football World Cup in 2022, scheduled to be held in Qatar. For this purpose, a CLFR solar collector field has been developed to power a 1MW absorption chiller for the purpose of air conditioning of a 500-seat showcase football stadium at Doha in Qatar. COOL4SEA, a Denmark based company, has developed an innovative idea in which unused waste heat from ships is used for powering absorption chillers installed in the ships for the purpose of cooling and refrigeration. The world over, 50,000 ships discard US$ 145,000 per ship each year in the form of unused waste heat. This is a huge waste of resources and the operational costs for the ship also become high due to this fact. In addition, there is a high environmental impact in terms of unnecessary carbon dioxide emissions. COOL4SEA’s new technique will utilize this wasted heat generated from the ships and use it for cooling purposes and power the refrigeration system of the ship. For this purpose, the company has developed a sea going absorption chiller. COOL4SEA applied for the Letters Patent to the United States in May 2014 for this technology. The company claims that their absorption chiller unit will provide their customers with savings of approximately US$ 135,000 per ship per year in the form of saving of fossil fuels and a reduction in the costs of maintenance. In addition, ships will save on green taxes, thereby enabling shipping companies to acquire a more environmentally friendly profile – a potential competitive advantage. COOL4SEA’s cooling system utilizes waste heat from the primary and secondary machinery for cooling and heating purposes on a ship. The cooling solution is based on the working principle of absorption chillers. The unique feature of this type of absorption chiller on a ship is that it works on a special type of salt instead of ammonia, and thus is more environment friendly and also has a lower purchase cost. Another advantage of this type of absorption chiller being developed by the company is that it has a low maintenance cost and generates electricity savings equivalent to about US$ 500 per day. Asia Pacific is anticipated to be the most lucrative market for absorption chillers, with sales revenue in China and India expected to register CAGRs of 7.2% and 7.1% respectively over the forecast period. Absorption chillers consumption in the ASEAN region increased to a small extent yet witnessed a growth rate of 5.0% outperforming many countries in the Europe and Americas. Middle East and Africa followed by Europe are the other attractive regions with an estimated revenue share of 22.9% and 20.1% of the global absorption chillers market by 2017 end. Sales of absorption chillers in MEA is estimated to be valued at US$ 289.2 Mn in 2017 and is expected to witness a stable CAGR of 7.0% over the forecast period. Developing economies such as those in the Asia Pacific and Middle East are expected to witness steady increase in demand for absorption chillers over the forecast period. High natural gas production in MEA combined with development in the number of infrastructure projects in the region makes it a lucrative market for absorption chillers over the forecast period. Shuangliang Eco-Energy Systems Co. Ltd.